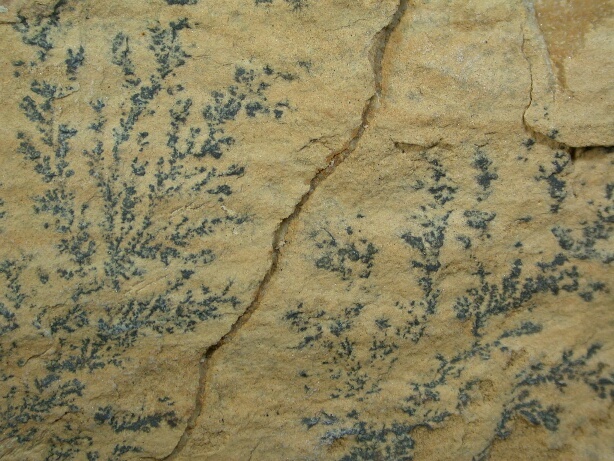 Manganese dendrites are branching features containing manganese oxides found on rock surfaces and in cracks in rocks. Here is an excellent example of a rock with manganese dendrites made of the mineral hollandite found in Afton Canyon, California. The field of view is about 8 cm across. And here is a picture of the dendrites from a classic locality, the limestone quarry near Solnhofen, Germany (field of view 3.0 cm). 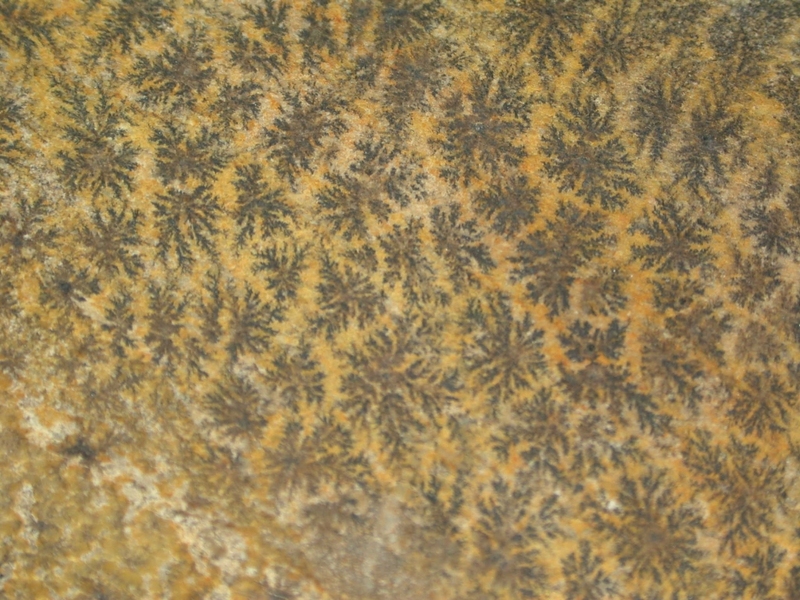 Dendrites are commonly, but incorrectly, believed to be the mineral pyrolusite (MnO2). In spite of the fact that many text books have stated that dendrites are pyrolusite, we have never found a dendrite containing pyrolusite. 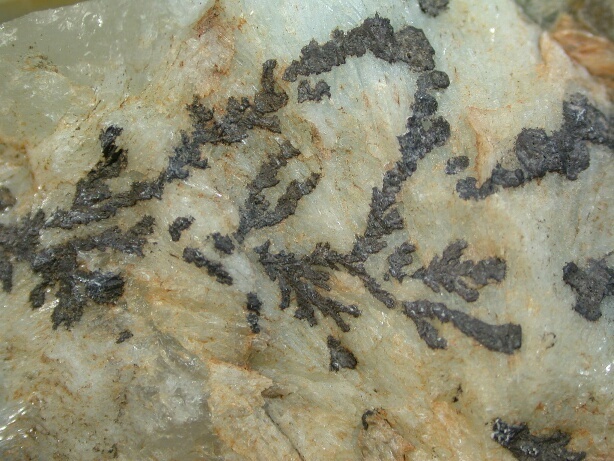 Instead, we have found that a variety of other manganese oxide minerals are contained in dendrites. What minerals are found in dendrites? 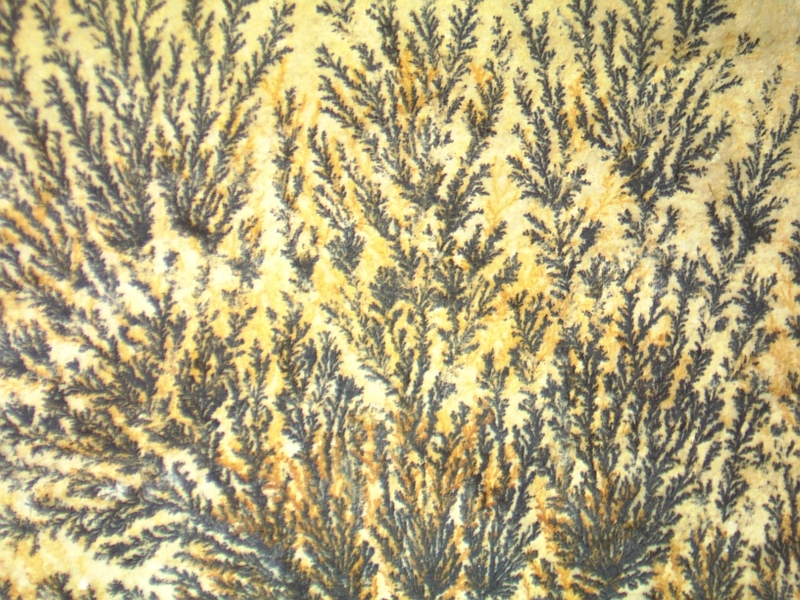 A variety of manganese oxides with the approximate chemical formula, MnO2 can form dendrites. 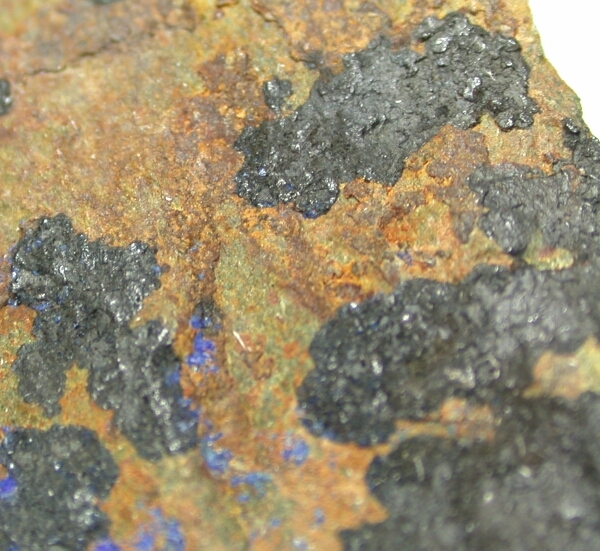 Dendrites from any particular locality tend to be comprised of a single mineral. We have found the following minerals in dendrites. You can click to see their chemical formula and atomic structure. How is charge balance maintained? The various cations other than Mn reside in the open channels of the structure. For each K or Ba, etc. in the formula, a corresponding amount of Mn4+ is reduced to either Mn3+ or Mn2+. 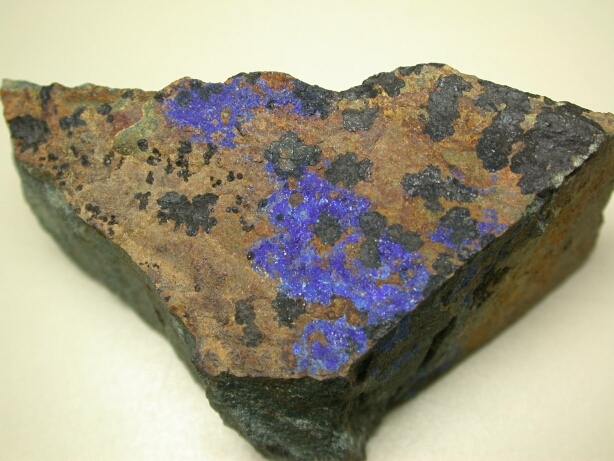 The average oxidation state of Mn in many of these minerals is typically 3.4 to 3.7. The first point of interest is that one can not tell the mineralogical composition of a dendrite by its physical appearence. This is a hollandite dendrite on a fine-grained rock outcropping in the Argus Range, Mojave Desert, Southern California. 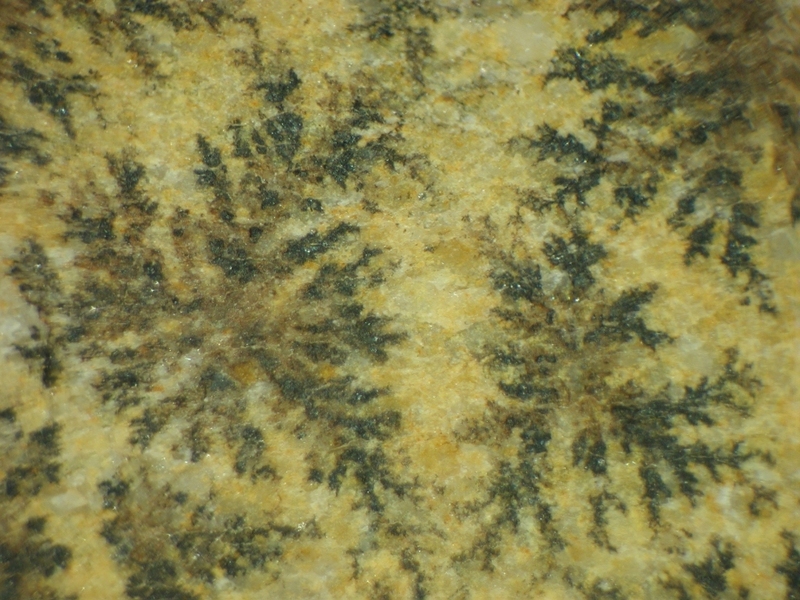 This is a romanechite dendrite on a siltstone from the Mojave Desert, Southern California, near Barstow. And this is a romanechite dendrite (103K) from South Dakota. This is a cryptomelane dendrite southwestern USA. The field of view is 1 cm across. Under high magnification in a scanning electron microscope, you can observe individual crystals (48K) of cryptomelane that make up the dendrite in this 30 micrometer wide field of view. This is a todorokite dendrite on a granitic pegmatite in an underground portion of the White Queen beryl mine near Pala, San Diego County, California. Can minerals other than manganese oxides form dendrites? Yes. 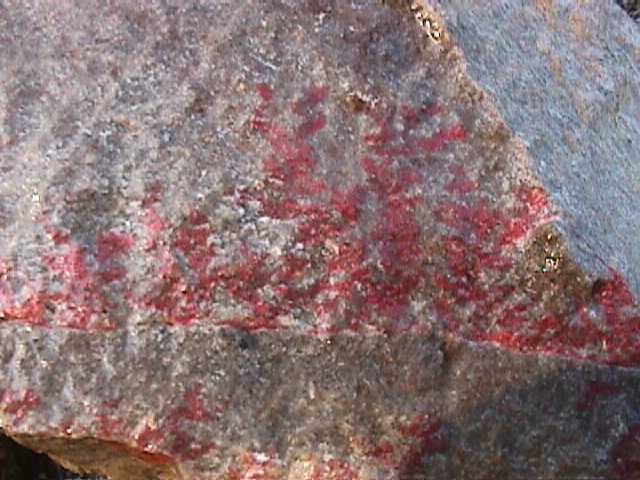 Here is an image of a cinnabar dendrite from the Funderburk cinnabar mine, Pike County, Arkansas, USA. Image contributed by Mike Howard, Arkansas Geological Commission. Potter RM, Rossman GR (1979) The mineralogy of manganese dendrites and coatings. American Mineralogist 64, 1219-1226. Post JE, McKeown DA (2001) Characterization of manganese oxide mineralogy in rock varnish and dendrites using X-ray absorption spectroscopy. American Mineralogist 86, 701-713. Xu H, Chen T, Konishi H (2010) HRTEM investigation of trilling todorokite and nano-phases in manganese dendrites. 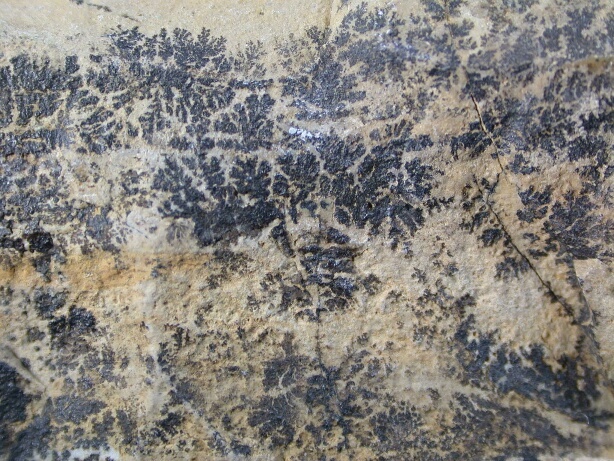 American Mineralogist 95, 556-562.
http://www.mindat.org/forum.php?read,17,268804,page=1 A discussion on dendrites with many excellent images.